I started this anthology when it was first released back in December '08 for the short story by Sherrilyn Kenyon. 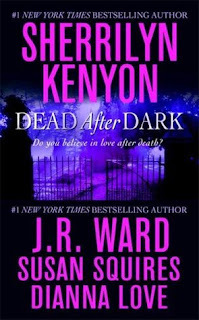 Then I discovered last month that the new series by Sherrilyn Kenyon & Dianna Love is prefaced by Dianna Love's short story, and I gobbled up the rest of the book. 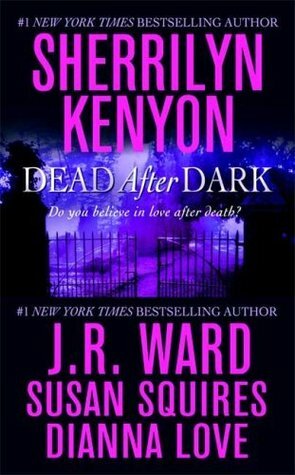 All of the stories in this anthology are part of a series: "Shadow of the Moon" by Sherrilyn Kenyon is part of her Were-Hunter series, "The Story of Son" by J.R. Ward is related to the Black Dagger Brotherhood series, "Beyond the Night" by Susan Squires is a Companion novella, and "Midnight Kiss Goodbye" by Dianna Love is the first story in the new Belador urban fantasy series. I haven't read the Companion novels, but the rest of the stories tie in nicely with their related series. Susan Squires's story was interesting, but I wasn't at all invested in the series so it didn't do much for me. And I love everything by Sherrilyn Kenyon, but most of her stories start to sound the same after a while, so it wasn't exactly earth-shattering. My favorites were "The Story of Son" and "Midnight Kiss Goodbye." J.R. Ward managed to write a completely unique story that I can only hope will at some point be integrated with the current series. Dianna Love's Belador prequel was fantastic because I couldn't wait to get my hands on the new series, and it served as an easy introduction to the world Love and Kenyon created. Overall, I would give this anthology a five-star rating because the stories I did love were so fantastic!